These sticker sheets printed for a new product launch of Dog Pamper Products including Paw Balm and Snout salve. Printed in high quality full colour on both matt and gloss self-adhesive vinyl, these stickers are very durable and fully waterproof and are being applied to the lid and base of the pamper products. Our sticker sheets can have almost any shapes kiss-cut from circles, ovals, squares, through to fairly intricate shapes. We print onto gloss or matt white vinyl so you can have a lovely glossy finish or a more contemporary matt finish. Either way you can be sure your stickers will be hard wearing and long lasting. These car window stickers were printed full colour onto white self cling vinyl. This vinyl stays put on your window through static properties alone and so will not leave any sticky residue when removed. The window stickers can also be removed and re-applied. The window stickers are fully waterproof so can go through the rigours of car washing without any issues arising. Client's often ask us the best way to apply self cling window stickers. As the cling window stickers stay put through static properties alone, so any dirt, grease or cleaning agent trapped between the cling sticker and glass will act as a barrier and it will lose its holding ability. The cling may also struggle to cling to very cold glass when first applied, so we recommend in winter months, applying the sticker when the vehicle has been pre-heated. Or once the glass is clean and grease free, in the winter it can really help to wet the cling sticker and or glass with warm water before applying and then press the cling sticker firmly in place (the cling sticker is fully waterproof so this will not affect the print or sticker). Once the sticker clings well it will stay perfectly in place. We manufacture a wide range of window stickers for the public sector. 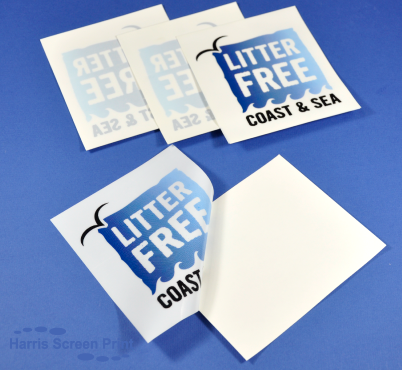 A current popular campaign for Councils is the Litter Free Coast and Sea, which is a community campaign to reduce marine and beach liter, and improve bathing water quality across Dorset. The public sector have purchased high quantities of window stikers printed onto the static cling vinyl so they can be easily peeled away and re-positioned. You'll see them on car, shop, office and restaurant windows to promote the campaign. You can find out more on their website LITTER FREE COAST AND SEA. Window stickers are a brilliant way to promote a local campaign, as each individual sticker will be seen time and time again by passers by for months and years to come. Find out more about Public sector stickers we manufacture on our dedicated web page. We print a wide range of window stickers. These window stickers were printed for sticking onto the inside of the car windscreen, or car dash, to be viewed by the Driver. So these stickers are sticky on the back. They were printed onto removable self adhesive vinyl which is our low tack option. 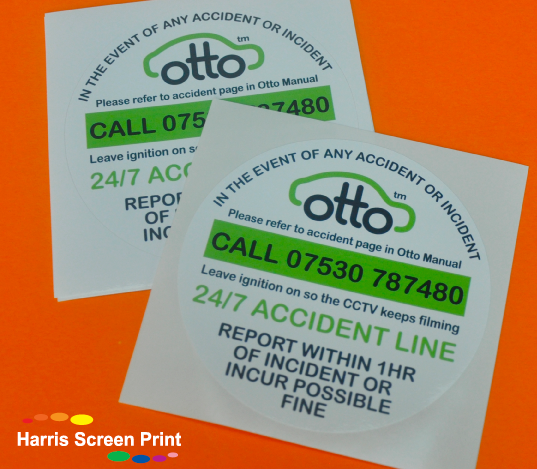 The window stickers can be written on, so are ideal for service and mot reminders, emergency and accident helplines, as well as car hire companies. These window stickers are fully waterproof so will stand up perfectly well when the inside of the windscreen is washed or cleaned. 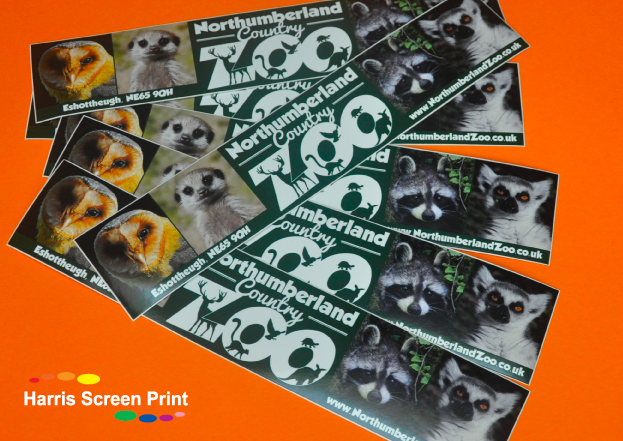 These outdoor waterproof car bumper stickers were printed for Northumberland Country Zoo. Long lasting and durable, fully waterproof for outdoor use, these stickers can be applied to vehicle bumpers to promote their day out. 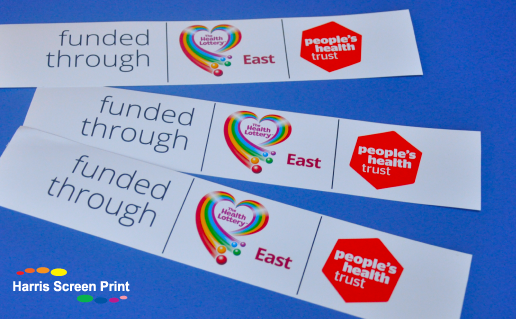 Our car bumper stickers, printed full colour process onto white gloss self-adhesive vinyl are printed using solvent based inks, so will hold their vibrant colours year after year and will not fade in sunlight easily. We recently printed charity car window stickers for the Didim Animal Shelter. The size of these stickers is 100mm diameter circles, which is most popular size for round car rear window stickers. We offer charitable discounts and special perks wherever possible for charities, and in this case we printed double the quantity ordered to help support the Shelter. We print full colour bespoke cut window stickers. These window stickers were recently printed onto self-adhesive vinyl in full colour with a white background and then kiss cut to an intricate shape around the design. The stickers are cut down and supplied in bulk as indivdiuals so ideal to hand out or mail out to your customers or retailers to promote your products and branding. Having bespoke shaped stickers really makes them stand out from others, and they don't cost as much as you might think! 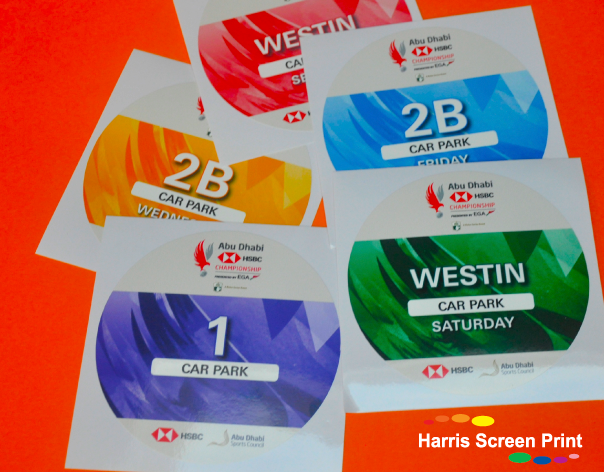 Car windscreen permit stickers printed with mixed designs for the Volvo World Match Play Championships. A variety of designs and colourways were printed to identify the day and car park number where it was valid. 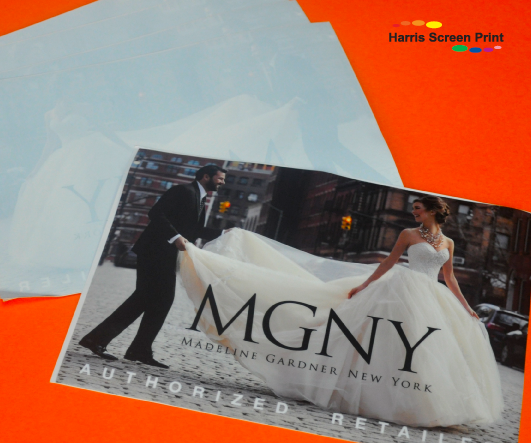 These window stickers were reverse printed onto removable self-adhesive vinyl, which is a low tack adhesive. This easily peels away when removed a few days or weeks after application, so ideal for event car parking permit stickers. They were supplied as singles so ideal to either post out in advance or hand out on the day. These car windscreen permit stickers were printed onto white static cling vinyl. This is the non sticky type which stay put through static properties alone, so perfect for identifying cars parking at events. This order had a mix of designs and colours so parking attendants could easily identify which car park the driver should be directed to. These circle cut car window stickers had a vibrant design with great branding. These outdoor waterproof car stickers were printed full colour onto white gloss permanent self adhesive vinyl. Mixed designs were printed for the order and these stickers are for application onto the exterior of cars and vehicles, fully waterproof and lightfast so the brand advertising will be strong and vibrant year after year. 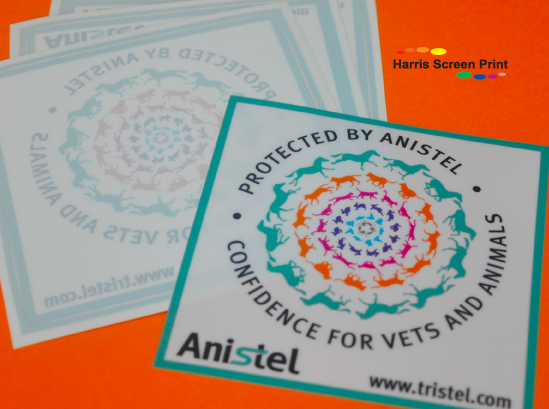 These window stickers were printed full colour with white background for a vet group. We will print any design onto your full colour window stickers and if you do not have your own artwork, just email us your logo and text you would like and we will prepare a sticker layout for you at no extra charge. These window stickers were printed full colour with a white backup, the size is ideal for displaying in shop windows. Our window stickers are printed using lightfast inks so they will not fade easily in sunlight, so you can be sure your stickers will last year after year and keep your branding vivid and strong. Our self-cling permit stickers are great for applying to the inside of car windscreens, and can be removed at any time without leaving any residue. The self-cling window stickers stay put through static properties alone. In winter months we always recommend applying the cling stickers to a pre-heated vehicle as the initial cling has a better result in a warmer environment. 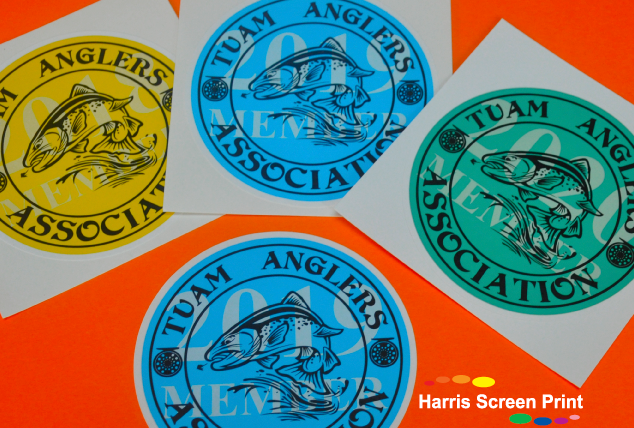 These permit stickers are great where there are several versions for an event, as the stickers are supplied design face-up, so easy to identify. They are also ideal for writing on, so if you wanted a blank box to write in expiry date or registration number we can include this within your car park sticker design. The most popular size for car windscreen permit stickers is 75mm diameter circles, but for short term events where it is important for car park stewards to identify the permit our clients go for much larger, up to around 120mm or 150mm diameter circles. 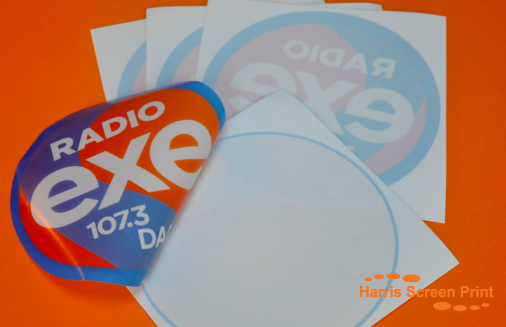 Car rear window stickers printed recently for a radio station, a great way to advertise your brand. These car window stickers were reverse printed full colour with white backup onto self adhesive vinyl, and kiss cut to circle shape. We print car window stickers using solvent based inks, so they are UV stable (will not fade easily in sunlight) and will last year after year. Some suppliers manufacture stickers at very low prices, but their inks will fade within the first year, which stops your purchase being value for money. So if you want your car window stickers to look great year after year, be sure to get a quotation from Harris Screen Print.